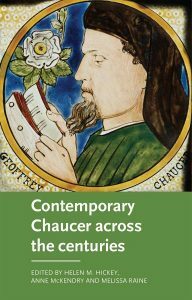 Congratulations to ANZAMEMS members Helen Hickey, Anne McKendry and Melissa Raine on the publication of their co-edited collection Contemporary Chaucer across the Centuries (Manchester University Press, 2018). It is doubly pleasing that the book is a festschrift for long-time ANZAMEMS member and past president Stephanie Trigg, who has contributed so much to the Association and to the wider field of medieval and early modern studies. Below, the editors reflect on what inspired their book and the diverse approaches contributors take to its unifying themes. “We were delighted to take up the opportunity to celebrate Stephanie Trigg’s academic achievements as well as her tireless fostering of scholarly communities throughout her career. Our intention was to create a vibrant collection that attests to her achievements and her generosity as a researcher. We felt that within Stephanie’s wide-ranging interests, Geoffrey Chaucer was central to the progression of her own ideas and her sphere of influence. For over 700 years, many readers have claimed powerful personal connections not only with Chaucer’s writing, but with the author himself. Stephanie’s Congenial Souls (2001) delved deeply into the desires that Chaucer’s literary output has both created and fed throughout those seven centuries. This mode of inquiry, which she describes as a symptomatic long history, makes explicit the stakes and the manoeuvres that give shape to the experience of communing with the Chaucerian text, its author, and the age in which he lived, claims that are at times proprietorial and exclusive, and at others challenging and resistant. Stephanie has since employed this methodology to interrogate hierarchised distinctions between scholarly and creative responses to medieval culture, the latter often known as medievalism. Congenial Souls therefore offers an important contribution to Chaucer scholarship, but further lays down groundwork for researchers of medieval culture to reflect on the broader significance of their own practices. Two decades after the publication of Congenial Souls, we felt it was timely to review current debates surrounding the traditions, emotions and intellectual underpinnings of Chaucer scholarship, and the implications of this work for researching the Middle Ages more generally. Contemporary Chaucer across the Centuries showcases the contributions of fourteen outstanding thinkers in the field who explore both Chaucer’s writing and the longue durée of its reception. The diversity of topics and approaches evinces the dynamic and innovative research that Chaucer’s writing continues to inspire, as well as the resonance of Stephanie’s insights within contemporary Chaucer research. Each essay stands alone as a significant contribution to Chaucer scholarship, in some cases drawing attention to features of Chaucer’s poetic techniques and intertextual allusions that have gone unnoticed, despite extensive poring over Chaucer’s oeuvre. Some are inspired by or engage directly with Stephanie’s work on authorship, emotions and medievalism to produce fresh insights into the faces, bodies and environments found within Chaucer’s narratives; others consider emotions and connection with Chaucer himself in critical analyses as well as in creative forms such as cinema and stand-up comedy. The historical development of Chaucer’s legacy is represented in a variety of contexts, from scribal activity and early print culture through to contests over national identity in the nineteenth century. Several essays address how critical trends and challenges both shape and are impacted by Chaucer’s canonical status, and many individual essays attend to combinations of these themes. Together, they create a dialogue about what the past means in our own present moment, and why Chaucer continues to be such a source of fascination and reward. These essays confirm that we are never truly “done” with the past; we continue to return with new questions to Chaucer’s writing and the astonishing experience of immediacy that it produces in readers even as temporal distance increases. The changing present compels us to reconsider, re-evaluate, and reappraise the connections between literary traditions and contemporary scholarship, and past and present more broadly. Contemporary Chaucer across the Centuries is also inflected by the diversity of our own research interests. 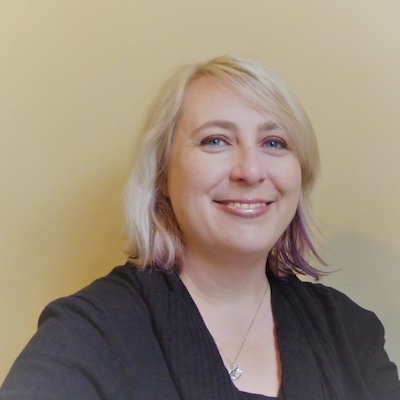 Melissa is currently working on children’s voices in both medieval literature and contemporary Australian culture. In both contexts, she explores how historically specific ideas about childhood, especially the relationships of children with adults, shape the communication of actual and imagined children, including some created by Chaucer. Anne is at the proofing stage of her first monograph, Medieval Crime Fiction: A Critical Overview, which will be published by McFarland in April and offers the first sustained analysis of this neglected but extremely popular example of contemporary medievalism. She is also finalising an article for Exemplaria that considers Chaucer’s Knight’s Tale through Georges Bataille’s theory of an economics of waste. Helen is currently working on feet in medieval and early modern poetics and art, and on ideas of beauty and aesthetics in medieval European poetry. She is completing a chapter on Thomas Hoccleve’s poetics through theories of embodiment. ANZAMEMS members wishing to promote their research through the ANZAMEMS newsletter are invited to email the editor, Amanda McVitty. We particularly welcome approaches from early career scholars. This entry was posted in ANZAMEMS, member news, publication on 11 March 2019 by ANZAMEMSComms. Congratulations to all the recipients of ANZAMEMS biennial conference awards and publication prizes, announced last week at the ANZAMEMS 2019 conference. Kirk Essary, for his article “Clear as Mud: Metaphor, Emotion and Meaning in Early Modern England”, English Studies, July 2017. The Philippa Maddern ECR Publication Prize is awarded to an Early Career Researcher (ECR) for the best article-length scholarly work in any discipline/topic falling within the scope of medieval and early modern studies, published within the previous two years. Amy Brown, for her article “Female Homosociality and the Marriage Plot: Women and Marriage Negotiation in Cligés and Le Chevalier au Lion“, Parergon, 33.1 (2016). The Patricia Crawford Postgraduate Publication Prize is awarded to a postgraduate student for the best article-length scholarly work in any discipline/topic falling within the scope of medieval and early modern studies, published within the previous two years. The George Yule Prize is awarded to the best essay written by a postgraduate. It is awarded biennially, at each ANZAMEMS conference. In 2003, ANZAMEMS established a bursary to honour the life and work of Dr Kim Walker, lecturer in English (with specialties in renaissance studies and Shakespeare) at Victoria University of Wellington. The prize winner is selected from among the applicants for conference bursaries. For further information on ANZAMEMS prizes and awards, please see the Bursaries and Prizes section on the ANZAMEMS website. This entry was posted in ANZAMEMS, member news, prize on 12 February 2019 by ANZAMEMSComms. Postgraduates (including Honours students) and ECRs are invited to join ANZAMEMS Postgraduate Representatives Hannah Skipworth and Lisa Rolston for this free and friendly reception at ANZAMEMS 2019. The ambition behind this year’s event is to provide postgraduates with an opportunity to meet their peers from around Australia and New Zealand and establish connections that will carry them into future endeavours. During this event, we encourage students in the final stages of their dissertations to seek out those who may be new to further research. After all, everyone needs a friendly bit of encouragement (but also some real talk) now and then! Sharing platters and a modest bar tab will be provided. This entry was posted in ANZAMEMS, conference, member news on 18 January 2019 by ANZAMEMSComms. To all ANZAMEMS members: membership fees are now due for 2019. If you have not yet paid your fees, please ensure you do this promptly to ensure continuation of member benefits, including delivery of the journal Parergon. In order to receive a hard copy of Parergon 36.1 you will need to pay your 2019 membership fees by 31 March 2019. Please also note that you will need to be a financial member to vote at the upcoming AGM in April as well as to nominate for any vacant Committee member roles. Payment should be made via the ANZAMEMS website. Receipts will be posted with the next convenient issue of Parergon. Some members may experience an issue with the University of Western Australia (UWA) cart system that ANZAMEMS uses to process membership payments if you choose to pay online. If you have attempted to pay you membership fees online and have been having trouble with the ‘Captcha’ system on the shopping cart please try using another internet browser and see if that fixes the problem. UWA is currently looking into this issue. Cheques or money orders must be made out to “The University of Western Australia – ANZAMEMS”. This entry was posted in ANZAMEMS, member news on 14 January 2019 by ANZAMEMSComms. 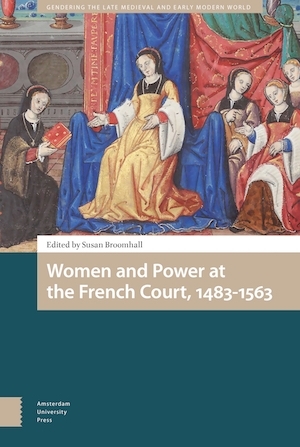 Congratulations to ANZAMEMS’ member and Parergon journal editor Professor Susan Broomhall on the publication of a new edited collection, Women and Power at the French Court, 1483-1563 (Amsterdam University Press, 2018). Women and Power at the French Court, 1483—1563 explores the ways in which a range of women “ as consorts, regents, mistresses, factional power players, attendants at court, or as objects of courtly patronage “ wielded power in order to advance individual, familial, and factional agendas at the early sixteenth-century French court. Spring-boarding from the burgeoning scholarship of gender, the political, and power in early modern Europe, the collection provides a perspective from the French court, from the reigns of Charles VIII to Henri II, a time when the French court was a renowned center of culture and at which women played important roles. Crossdisciplinary in its perspectives, these essays by historians, art and literary scholars investigate the dynamic operations of gendered power in political acts, recognized status as queens and regents, ritualized behaviors such as gift-giving, educational coteries, and through social networking, literary and artistic patronage, female authorship, and epistolary strategies. This entry was posted in ANZAMEMS, member news, publication on 6 December 2018 by ANZAMEMSComms. I work primarily on the intellectual history of medieval and early modern Europe. I am motivated by an interest in cosmologies: the way societies have understood how the world works and the role humankind has within in the universe. My research interests include demonology, witchcraft, science and experimental philosophy, theology, metaphysics, mythology and the supernatural. I received my doctorate from the University of Melbourne and am currently research assistant to Charles Zika at the ARC Centre of Excellence for the History of Emotions at the University of Melbourne. I am also the announcements editor for the International Society for Intellectual History. Glanvill is well known in the history of both witchcraft and the Royal Society of London. He was, after all, friends with notable figures like Henry More, Robert Boyle and Richard Baxter. However, few scholars have attempted a comprehensive investigation into Glanvill’s eclectic body of work. Science in an Enchanted World: Philosophy and Witchcraft in the Work of Joseph Glanvill is an exploration of the relationship between Glanvill’s work on witchcraft, the Saducismus triumphatus, and the ideas he presented in his well-regarded works on the experimental method of the Royal Society, metaphysics, theology and pastoral care. The result is a multidisciplinary work that offers a unifying perspective on Glanvill’s diverse works and a resource to help future scholars navigate through the multiple editions and versions of Glanvill’s complex corpus. In current research I am looking at remedies for melancholy and am heading to the Herzog August Bibliothek in early 2019 to compare the work and motivations of some early English and German female botanists. This kicks off my next big project on the place of horticulture, herbalism and botany in the lives of European women. I’m also particularly interested in when scientific and religious practices were recommended as paths towards emotional well-being. My other recent publications include a collection edited with Michael Pickering A World Enchanted: Magic and the Margins (2014), “Botanizing at Badminton House: The Botanical Pursuits of Mary Somerset, First Duchess of Beaufort” in Domesticity in the Making of Modern Science, edited by Donald Opitz, Brigitte van Tiggelen and Staffan Bergwik (2015) and “German Receptions of the Works of Joseph Glanvill: Philosophical Transmissions from England to Germany in the Late Seventeenth and Early Eighteenth Century” in Intellectual History Review (2016). ANZAMEMS members who would like to profile their recent book-length publications via the newsletter should contact the editor, amanda.mcvitty@gmail.com. We particularly encourage early career scholars and those with first books to get in touch. This entry was posted in ANZAMEMS, member news, publication on 13 November 2018 by ANZAMEMSComms. Congratulations to Aidan Norrie and Marina Gerzic on the publication of their edited collection From Medievalism to Early-Modernism: Adapting the English Past, which is now available to pre-order from Routledge. The collection features several ANZAMEMS members both current (including Aidan Norrie, Annie Blachly), and past (Marina Gerzic, Hilary Jane Locke, and Martin Laidlaw). The contributed chapters are based on a panel organised at the ANZAMEMS 2017 conference in Wellington. From Medievalism to Early-Modernism is a collection of essays that both analyses the historical and cultural medieval and early modern past, and engages with the medievalism and early-modernism—a new term introduced in this collection—present in contemporary popular culture. By focusing on often overlooked uses of the past in contemporary culture—such as the allusions to John Webster’s The Duchess of Malfi (1623) in J.K. Rowling’s Harry Potter books, and the impact of intertextual references and internet fandom on the BBC’s The Hollow Crown: The Wars of the Roses—the contributors illustrate how cinematic, televisual, artistic, and literary depictions of the historical and cultural past not only re-purpose the past in varying ways, but also build on a history of adaptations that audiences have come to know and expect. From Medievalism to Early-Modernism: Adapting the English Past analyses the way that the medieval and early modern periods are used in modern adaptations, and how these adaptations both reflect contemporary concerns, and engage with a history of intertextuality and intervisuality. ANZAMEMS members wishing to promote recently published monographs or edited collections through the ANZAMEMS newsletter are welcome to send publication details to the newsletter editor Amanda McVitty. This entry was posted in member news, publication on 21 August 2018 by ANZAMEMSComms. Congratulations to ANZAMEMS members Merridee L. Bailey, Tania M. Colwell, and Julie Hotchin on the publication of their edited book Women and Work in Premodern Europe: Experiences, Relationships and Cultural Representation, c. 1100-1800 (Routledge). This book re-evaluates and extends understandings about how work was conceived and what it could entail for women in the premodern period in Europe from c. 1100 to c. 1800. It does this by building on the impressive growth in literature on women’s working experiences, and by adopting new interpretive approaches that expand received assumptions about what constituted ‘work’ for women. While attention to the diversity of women’s contributions to the economy has done much to make the breadth of women’s experiences of labour visible, this volume takes a more expansive conceptual approach to the notion of work and considers the social and cultural dimensions in which activities were construed and valued as work. This interdisciplinary collection thus advances concepts of work that encompass cultural activities in addition to more traditional economic understandings of work as employment or labour for production. The chapters reconceptualise and explore work for women by asking how the working lives of historical women were enacted and represented, and they analyse the relationships that shaped women’s experiences of work across the European premodern period. A flyer for the book is attached. This includes a 20% discount offer to purchasers. ANZAMEMS members who would like to promote recent book publications through the ANZAMEMS newsletter are welcome to forward the details to the newsletter editor Amanda McVitty (amanda.mcvitty@gmail.com). This entry was posted in member news, publication on 20 July 2018 by ANZAMEMSComms. There is a virtual room booking for ANZAMEMS members based at/around UC who might want to attend the AGM to be held 3-5pm Friday 9 March. The room’s location is Psychology 164 at the University of Canterbury. This entry was posted in ANZAMEMS, member news on 2 March 2018 by ANZAMEMSComms. In a time-honoured tradition, the AHA 2018 organising committee is pleased to announce that the deadline for submission of abstracts has been extended from 28 February to Monday 12 March 2018 at midnight. If you have been prevaricating you still have the chance to submit! Full call for papers. Paper and panel submissions can be made through the online abstract submission website; if you have a proposal for a roundtable please email the convenor direct. The committee would be grateful if you could spread the word to your non-AHA member colleagues as well. We are also pleased to announce that there will be no increase in the price of conference registration. This entry was posted in member news on 26 February 2018 by ANZAMEMSComms.